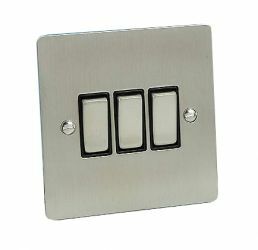 High quality 10A 3 gang lightswitch can be used for 1 or 2 way switching. 'Brushed chrome' is also known as 'satin chrome' or 'stainless steel'.
" Pretty good on delivery & packaging. Da iawn! " " An electrical shop which also does audio repairs and has a Recording Studio & Rehearsal Room attached to it - Unique! "